A commonality among most who call themselves Christian is the understanding of God as Trinity, that is, a singular entity existing as three persons: Father, Son (Jesus), and Spirit. That is confusing, but recall that Jesus said, “I and my Father are one,” (John 10:30). God is like water. Water exists in three forms: ice, liquid, and vapor. Each form is still water, albeit a different manifestation of it. Each form has different characteristics, but is still the same compound. So it is with the triune God: three forms, but one God. 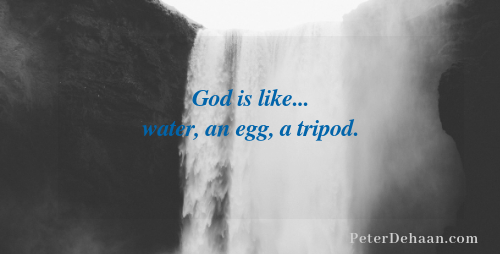 God has also been likened to an egg. An egg is composed of three main parts: the shell, the white, and the yolk. Collectively, they are an egg. In like manner, a singular God exists as three parts. I’d like to suggest a third image for consideration: God is like a tripod. A tripod has three legs. Each leg is part of the tripod; each leg is connected to the tripod; and each leg is essential for the tripod to work. Remove one leg and the tripod ceases to function. Also, each leg of the tripod is equal; no one leg is more important and no one leg is insignificant. So it is with God as a tripod. Each leg—Father, Son (Jesus), and Spirit—is connected, essential, and equal. Remove one and our perception of God becomes incomplete; over emphasize one and our understanding of God gets out of balance. There may be three parts (legs), but it is still one God (the tripod). The tripod reveals God as Trinity.